Merrell® is an outdoor brand that empowers people to challenge themselves in the great outside. Merrell® shoes and clothes are high quality and built to be used on the trail-out-of-the-box or off-of-the-hanger. Follow Merrell to get news updates and products on your homepage. Merrell is being followed by 0 people. Merrell is currently ranked 723 in the directory. Last month its rank was 1515. 44 products added to Merrell 1 day ago. 63 products added to Merrell 4 days ago. 33 products added to Merrell 8 days ago. 67 products added to Merrell 12 days ago. 143 products added to Merrell 15 days ago. 408 products added to Merrell 19 days ago. 5845 products added to Merrell 33 days ago. Updated The link Merrell was updated 55 days ago. 5152 products added to Merrell 69 days ago. 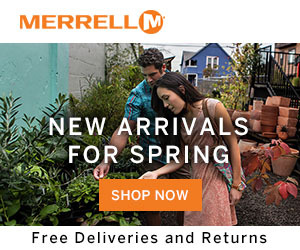 A Special Offer was added for Merrell: Extra 15% Off Sale Items with Code EXTRA15 287 days ago.